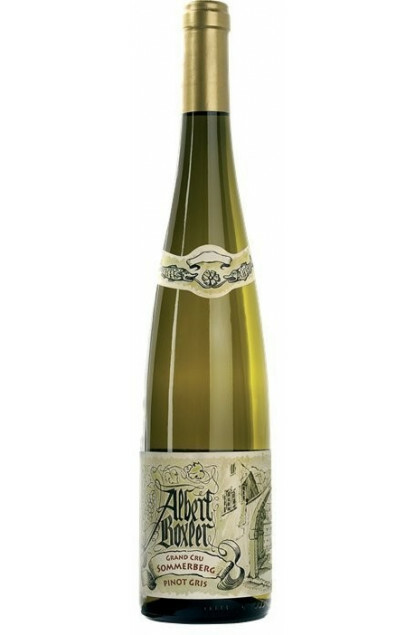 This Alsace wine comes from the classified Grand Cru Sommerberg terroir exclusively. It is a very expressive and very fine white wine with smoky notes. Very well balanced between fragrances and length in mouth. A superb 2012 vintage which will continue to improve in ageing in your cellar due to its unique Grand Cru origin. The Albert Boxler vineyard’s roots date back to 1673. This family owned vineyard is currently managed by Jean Boxler (one of Albert’s grandsons) and his wife Sylvie. It is located in NIEDERMORSCHWIHR, between KALTZENTHAL and TURCKHEIM, a village surrounded by hills, right next to COLMAR. The whole vineyard is planted on slopes, on very steep hillsides, thus making harvesting by hand quite difficult. It spreads on around 13 hectares, whose average yield is 65.000 bottles depending on the years. The vineyard is planted in Riesling (40%), pinot gris (20%), gewürztraminer (20%) and the rest in various Alsatian varieties. The House owns 4 hectares of Sommerberg Grand Cru’s 28 hectares, and 2 hectares on the Brand Grand Cru, of which some vine are more than 65 years old. The wine ferments in barrels for a year. In order to preserve every plot’s singularity, the wines are vinified plot by plot without necessarily blending them. Divine wines like we can only dream of.